During WWII, Germany adopted the Blitzkrieg style of warfare, which utilized combined land and air assaults to maximize the damage of the enemy"s forces. Because of this strategy, Germany became a highly mobile mechanized army. The Sd. Kfz. 251/1 half-track, produced by Hanomag was designed to enable superb cross-country performance and towing capacity. It was used to tow various artillery pieces and trailers, as well as used to carry infantry. The steering mechanism was designed to allow the vehicle to be driven like a normal truck. Twelve passengers, 2 MG42 machine guns, 2 automatic rifles, 6 rifles and a radio could be transported in the final Ausf. D variant. By the end of the war, about 10,000 Ausf. 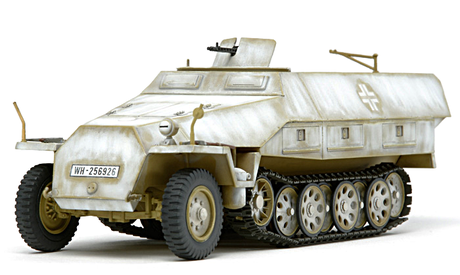 D vehicles were produced and were considered a reliable form of transportation for Panzergrenadiers. Special Feature 1 Decals and high quality pad printed markings have a life-like weathered appearance. Special Feature 2 This model features different markings to that of the assembly kit version.